En cada pueblo en Chile, hay un Palestino, un sacerdote y un policía. In every village in Chile, there’s a Palestinian, a priest and a policeman. In 1906 Nikolas Majluf arrived in South America after a sea voyage that had begun in Haifa, then part of the Ottoman Empire. He had changed ships in Marseille and continued to Buenos Aires, Argentina. From there, he traveled by mule over the Andes and ultimately settled in Victoria, Chile, nearly 1,000 kilometers south of Santiago, the nation’s capital. He was following a path that had been established by Palestinians who had begun arriving in Chile in the late 1800s. They struggled at first, but in ensuing decades they created both businesses and institutions, including schools, professional associations— and Club Deportivo Palestino (Palestinian Sport Club), the soccer team popularly known as “Palestino.” Founded just more than a century ago in Santiago and a member of Chile’s premier league since 1952, it has played such a unifying role in the community that its banner proclaims “Palestino—Mas que un equipo” (Palestino—More than a team). 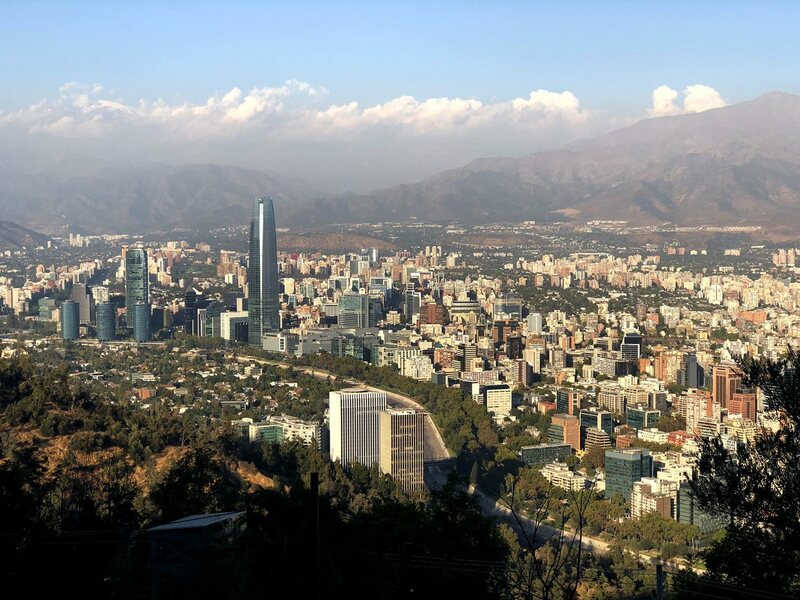 Santiago, a city of 10 million in a country of 17 million, stretches out below San Cristobal Hill, which rises from the edge of the Bella Vista neighborhood, where many immigrant Palestinians settled and that now is filled with restaurants, clubs and art galleries. The Palestino club's crest is painted on a wall at the Estadio Municipal de La Cisterna, the team's home stadium. The club’s history is intertwined with the Palestinian community in Chile and its roots in the Middle East, explains team spokeswoman Valeria Apara Hizmeri. Last year, the team even launched an effort to bring in soil from different communities in Palestine to spread on its home field to emphasize its enduring connection. “The team unites Palestinians and brings families to the stadiums together in a healthy, sporting environment” that includes Arab music and food, she says. “The club also represents the Palestinian spirit. It brings the Palestino flag to the highest level in international competitions [in South America],” she says. For his part, Majluf set up a small store. He did well, and soon his brother followed, explains Majluf’s 30-year-old great-grandson, Anuar Majluf. Next came their respective spouses and children, who had remained behind Beit Jala, a village south of Jerusalem that is now part of the Palestinian West Bank. Once the siblings were established, around 1911 their in-laws followed, too. 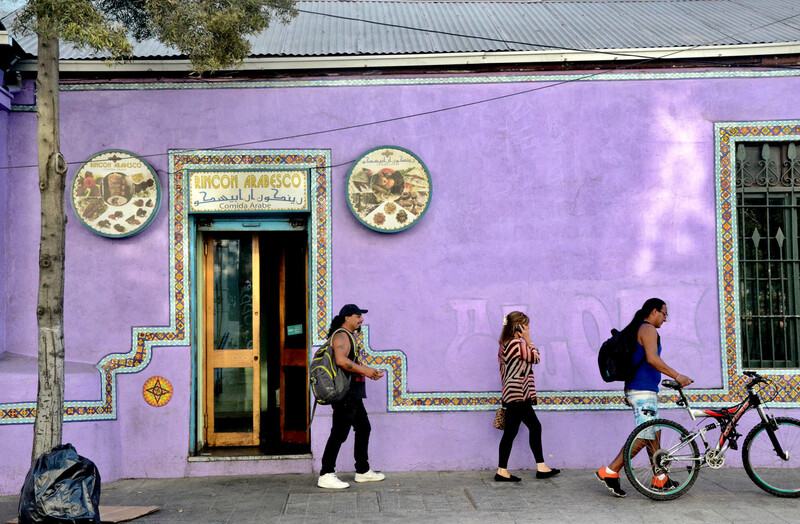 In Santiago's barrio Bellavista, the restaurant Rincon Arabesco (Arab Corner) signals the neighborhood’s Arab character. 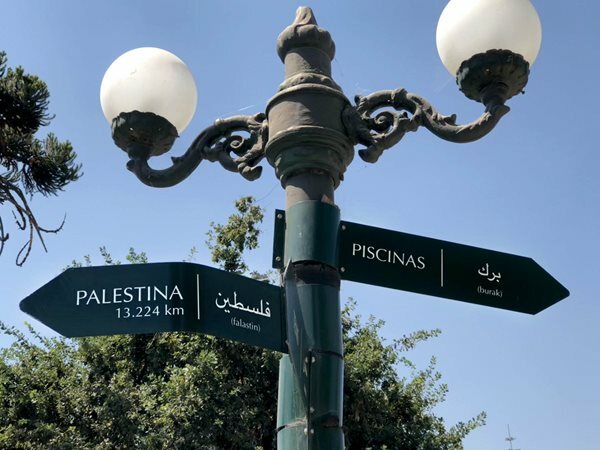 A lamppost gives the direction to local swimming pools and to Palestine, in Spanish and Arabic, in Santiago’s barrio Bellavista. When World War I engulfed the Middle East in 1914, still more Palestinians—many of them Orthodox Christians—emigrated to avoid being drafted into the armed forces of Turkey, which had allied with Germany. Many moved to Chile. Still more Palestinians arrived after the Arab-Israeli War in 1948, when tens of thousands fled, and ever since, others have continued to trickle in. At the bakery named Panadería y Pastelería Fufu—which has branches both in Santiago and in Beit Jala—I meet baker Johnny Abu Jeries, who says he arrived in Santiago only five years ago. Anuar Majluf, an attorney who is also executive director of the Palestinian Federation of Chile, tells me his family’s story as we sit on the patio of the Palestinian-owned Hotel Loreto in Santiago’s barrio Bella Vista. It was in this area, and in the barrio Patronato to its south, he explains, that numerous early Palestinian immigrants built homes and opened factories and businesses in the early 20th century. Now, Bella Vista has become an artsy quarter of clubs, restaurants and galleries, says Majluf, who also once led the General Union of Palestinian Students in Chile. 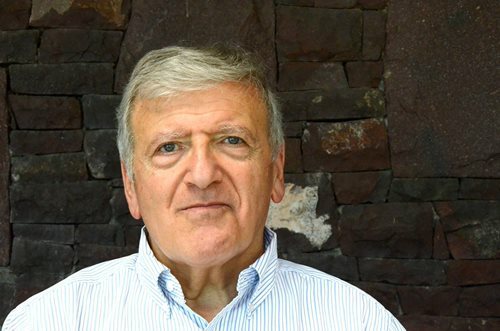 Manuel Hasbun Zaror, a 74-year-old engineer and, like Majluf a former head of the Palestinian Federation, says his forebears and other Palestinian immigrants struggled at first because they lacked resources, education and connections. Initially, they also faced some discrimination from Chileans with European roots. “Hard work, a thousand-year-old culture, faith and dedication to family led to our success in Chile," says Manuel Hasbun Zaror, an engineer and former head of the Palestinian Federation. “Hard work, a thousand-year-old culture, faith and dedication to family led to our success in Chile," Zaror tells me over lunch at the Palestinian Club in the upscale barrio Las Condes. Those accomplishments are on full display at the club’s expansive, palm-dotted enclave, which sports an Olympic-size pool, tennis courts and other facilities. Street signs are in Spanish and Arabic, and a doormat at the main entry to the club says, in Arabic, ahlan wa sahlan (“Welcome”). Al-Murshid, the Santiago Palestinian community’s first Arabic newspaper, began publishing in Patronato in 1912. Though the neighborhood now is home to immigrants from Korea, Peru, Venezuela, Bolivia, Haiti and more, it’s easy to find evidence of the district’s Palestinian past and present. Just down the street from Hotel Loreto, the Rincon Arabesco (Arab Corner) restaurant serves grilled-meat shawarmas, rellenos Arabes (peppers stuffed with meat and spices) and other Arab-influenced dishes; on a nearby avenue called Pio Nono, named for Pope Pius IX, which leads away from the famed San Cristobal Hill and its green funicular cable cars, a curbside stand sells dulces Arabes—Arab pastries such as halva and kunafah. On one morning, I enjoy a cup of strong coffee and baklava sweets at El Majrur, a café that takes its name from a neighborhood in Beit Jala. It stands on the same block in Patronato as the Orthodox cathedral of St. George, which is, along with the city’s two mosques, another community for Chileans of Palestinian descent. 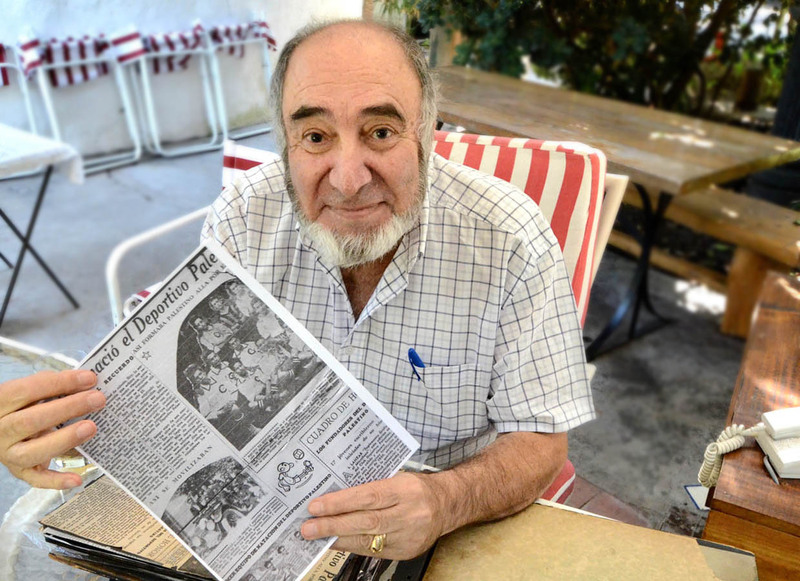 Former Palestino player Carlos Hasbun has collected newspaper clippings of the team for nearly 70 years. “It was beautiful, and I will always be proud of Palestino,” he says of his time with the club. According to Zaror and his distant cousin, 84-year-old Carlos Hasbun, Palestino was established in 1916 to compete against other Palestinian clubs in a national sporting competition held in Osorno, in southern Chile. Palestino won, and it went on to other successes, but it folded around 1930. Three decades later, it was revived, says Zaror, who adds that it was his brother Raul, now in his 80s, who helped restart the team and even played on it. In 1952 the club made the jump from the second division to the premier league—the top level of professional soccer in the country. While this day’s game proves an exciting back-and-forth contest that ends in a 1-1 draw—aided by plenty of raucous cheering from the home crowd—I quickly see just how Palestino is, as its motto goes, more than a soccer team. I hear time after time how it represents the Palestinian diaspora, not only in Chile, but also throughout Latin America and even around the globe. Accompanied by Majluf, I arrive early for the 5:00 p.m. game and, as a leader of the Palestinian Federation, he seems to know everyone. We settle into seats on the west side of the field with most of the Palestino hinchas (fans). 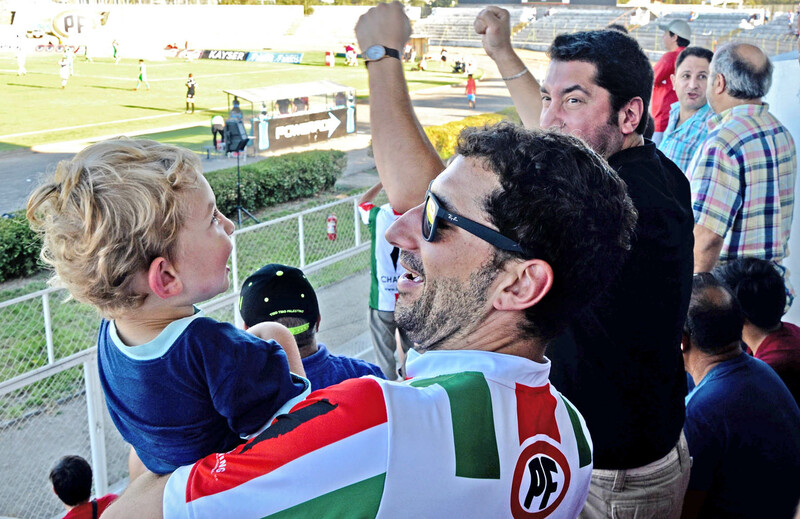 A Palestino fan shares the game with his son, reinforcing ties across generations with a global diaspora and land of origin half a world away. But my eyes and ears are soon drawn to the east side of the pitch where several drummers are booming out a rhythm and a man stands high on the rim of the stadium waving an enormous Palestinian national flag. This despite the fact that on the team’s current roster there is not a single player of Palestinian descent, though former defender Roberto Bishara now serves as a training coach. In 2016 Palestino actually flew to the West Bank city of Nablus, where they faced a local, all-Palestinian team—and lost 0-3. The match received full-page attention in the sports section of El Mercurio, the Santiago newspaper, and one columnist put the loss down to jet lag. 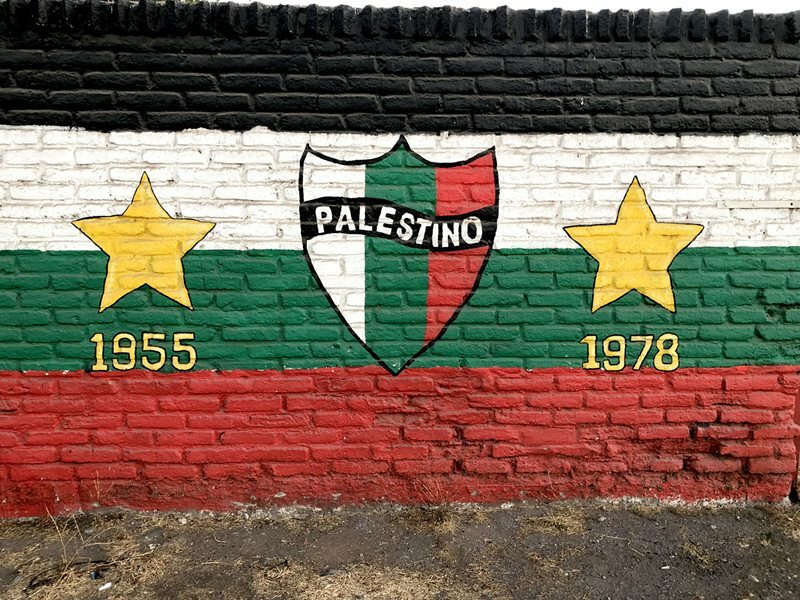 Elsewhere on the La Cisterna stadium property, painted murals boast of the team’s two premier-league championships (1955, 1978) and show off more colorful representations of the Palestinian flag. Majluf smiles as he describes growing up wanting to play for Palestino. “But that wasn’t realistic, just a childhood dream,” he says with a chuckle, noting that today, the fan base of the team has spread well beyond the Palestinian community. 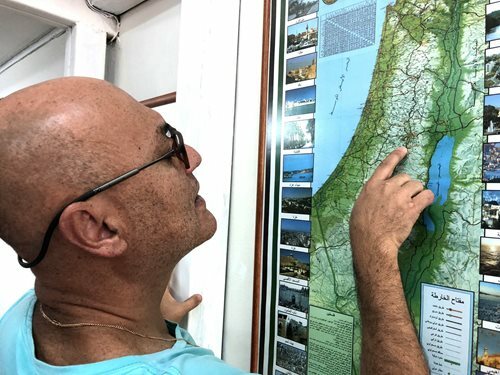 Mauricio Abu-Ghosh, whose father immigrated to Chile from Beit Jala in Palestine with his family at age 10 in 1951, locates their old hometown, which he visited several years ago. Palestinians have achieved success in Chilean politics, too, he adds, noting that in recent decades, around a dozen communities in Chile have elected leaders of Palestinian descent. Recoleta, the Santiago borough in which the barrio Patronato lies, recently elected Daniel Jadue alcalde (mayor). Isabel Plá Jarufe, descended from Palestinian immigrants, is serving in the cabinet of President Sebastián Piñera as Minister for Women and Gender Equity. For Majluf, who attended university in Jordan and has traveled to the West Bank several times, “win or lose, the soccer club proudly represents the State of Palestine and the diaspora in Latin American and around the world,” he says. On another morning, I meet Mauricio Abu-Ghosh, whose father came from Beit Jala with his family at age 10 in 1951. He recalls his father telling him how, as a young man, he had worked as a peddler, helping to support the family by walking from town to town selling needles and sewing supplies. Abu-Ghosh, 54 and also a former official with the Palestinian Federation, is an engineer by profession. He spent a decade working for LAN, the Chilean national airline, before opening a clothing company with his wife, Andrea, in Patronato. A big soccer fan, he says he played on recreational teams until he turned 50. 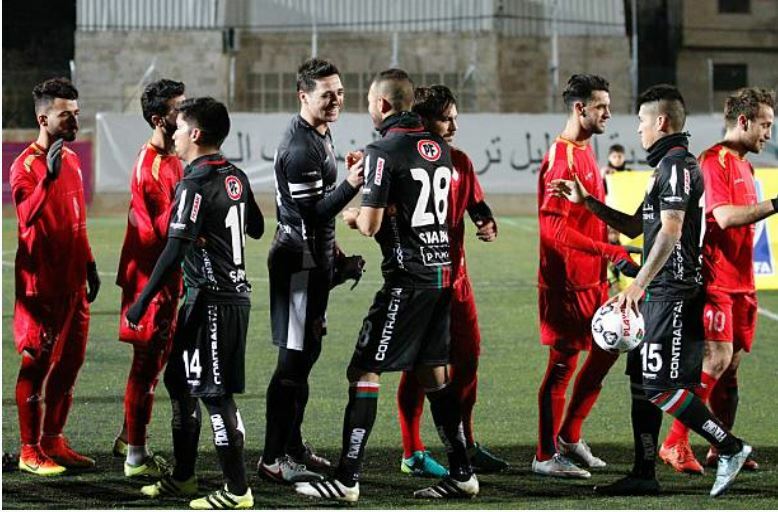 Palestino players shake hands with players from the Hebron Stars prior to a 1-1 draw match at al-Hussain Ali stadium in Hebron, Palestine, on December 15, 2016. The friendship game was part of the Chilean club's week-long visit, during which they played Palestinian teams, toured historical sites, met people and held soccer skills clinics, all to help connect the team to its origins. He says his relatives follow Palestino both online and, at times, by waking early to watch games live via satellite tv. That makes them not unlike Palestino fans in the rest of Palestine as well as Jordan, Tunisia and other parts of the world, where they follow Palestino on its social-media channels, says the team spokeswoman, noting that wherever they live, many of these hinchas wear Palestino jerseys on game days.